Who doesn't love fresh flowers in a jar? This is a bright and happy handmade card for today. Sentiment: You make me happy happy. This card is in the colors of yellow, gold and turquoise shades. I love the softness of it. I used die-cuts, pearls and patterned paper to accent. This could be for most any occasion; love, birthday, friendship, family, thank you, etc. Supplies: Unity Stamp of the Week Happy Happy, Copic markers, My Favorite Things die-namics, adhesive pearls, glitter paper, foam tape and gold cording. This card features Christmas decorations. The pretty ornaments hang from poinsettia and holly trimmings. These are actually two images that I paired together easily, then lightly colored them in. All that was left was to add tiny gems and paper accents. Supplies: Unity SOTW Ornate Joy and 10/2016 Holiday Hugs KOM; My Favorite Things die-namics, Copic markers, adhesive pearls, BasicGrey paper and foam tape. A festive Santa mouse holiday card. This little Santa mouse looks extra cute in this festive card. I put glitter on his cap and his hands. It shows up so sparkly in person. The panels are die-cut, adding to the festive look. Supplies: Unity Merry, Moe & Joe stamps, dies by My Creative Time and Spellbinders, Copic markers and snow glitter. This is a holiday greeting card featuring a cute little penguin. This penguin is attached to a spring. If you touch it, the panel will wobble. Sentiment: 'tis the season to be jolly. With the wobble effect, it is extra adorable. I kept this card in neutral tones. 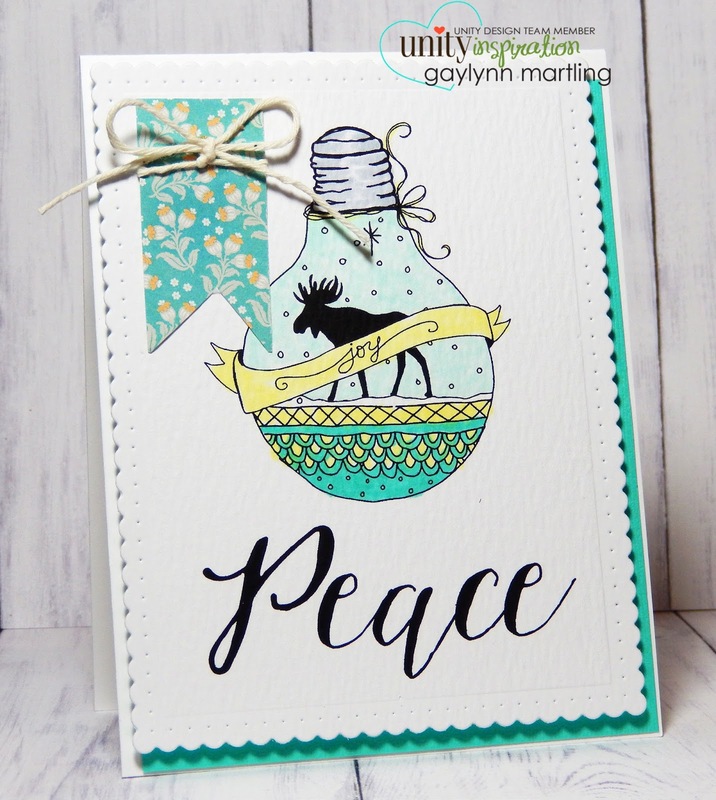 Supplies: Unity Holiday Cutie stamps, dies from MFT, My Creative Time and Spellbinders, Copic markers and Action Wobble. Today I have adorable owl Christmas cards and a little embossing tutorial. Sentiment: May your holidays be merry & bright. This little owl is surrounded by Christmas gifts and decorations. The image is on vellum. The background is embossed. I snapped a photo along the way while making this set of cards. Tools: Stencil, embossing paste, craft spatula, cardstock, plastic craft mat, masking tape, baby wipes, finished image panel. On a plastic craft mat, tape the stencil over your cardstock panel using masking tape or non permanent tape. Lift a small amount of paste with a craft spatula. Spread onto the stencil around the edges of the cardstock panel. Emboss as much area as you prefer. Lift off excess paste and returning it to the jar. Carefully remove the tape and stencil from the cardstock. Set aside the embossed panel to dry completely. Once the panel is dry, use it as a background for your craft project. While I had my supplies out, I made a set of these sweet holiday cards. Supplies: Unity Owl I Want stamps, My Favorite Things dies and stencil, My Creative Time dies, Dreamweaver Stencils metallic gold embossing paste, eyelets, vellum, Copic markers, doily and foam tape. I hope this inspires you today. These are quick and easy Christmas holiday gift tags. They all have teal and red colors and include a little "for you" sentiment. These tags are die-cut with tiny stitched detail and finished with white ribbon. I think I will make these in different colors to match my holiday wrapping papers. Supplies: Unity Holiday Delivery stamps, My Favorite Things die-namics, Copic markers and ribbon. These Christmas bulbs and inspirational sentiment make me want to sing. Sentiment: Joy to the world, the Lord has come. This is one of many holiday cards that I have been making to get a head start on the Christmas season. These big and beautiful ornaments stand on their own nicely. With just a couple of colors and some adhesive gems, it is ready to go. Supplies: Unity stamps from 10/2016 KOM Holiday Hugs and A Joyous Season; Copic markers, foam tape and adhesive gems. Here is Mister Fox in a winter holiday scene. Sentiment: Hope your holidays are full of love & joy. This is such a sweet scene. I kept this simple by adding a touch of color and layering the panels. Supplies: Unity stamps from Mister & Missus Fox and 10/2016 A Joyous Season sentiment kit; Copic markers, My Favorite Things dies and cording. Here is a warm and cozy winter holiday card with Missus Fox. Sentiment: Stay cozy this season. This sweet winter scene includes a girl fox, snowman, tree and pretty trim. This is great for Christmas or holiday cards or even a winter birthday. 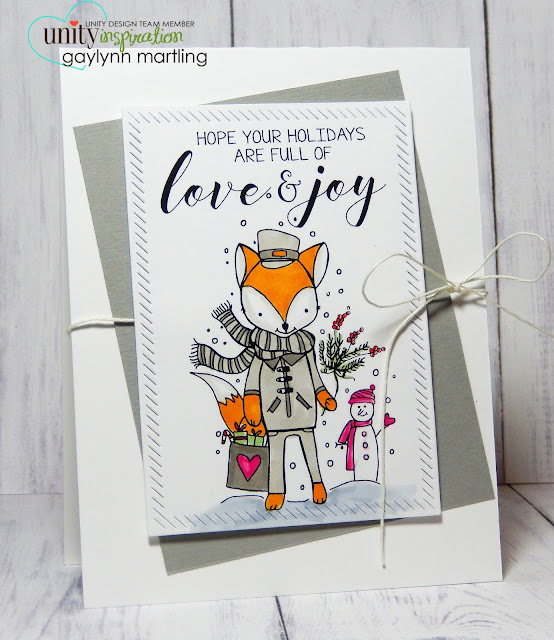 Supplies: Unity KOM 10/2016 Holiday Hugs and Mister & Missus Fox stamps; dies from Simon Says Stamp and Avery Elle; Copic markers. 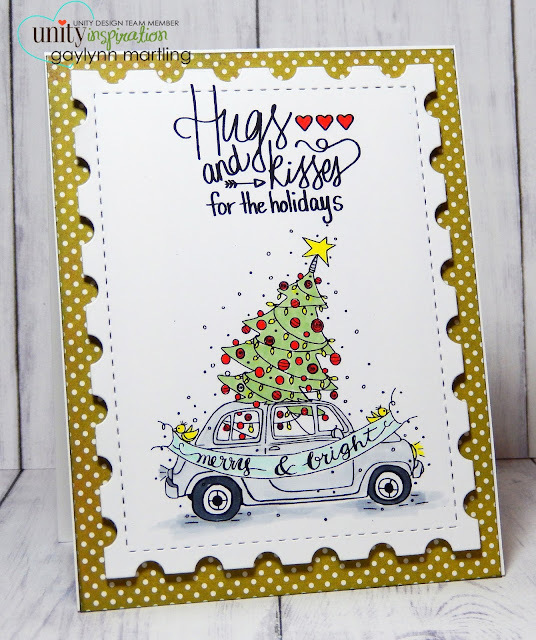 This is a festive car and tree Christmas or holiday card filled with hugs and kisses. Sentiment: Hugs and kisses for the holidays. Merry & bright. This is whimsical and cute. I especially like the banner held up by tiny birds. So sweet. Supplies: Unity 10/2016 KOM Holiday Hugs and Holiday Delivery stamps, Copic markers and My Creative Time dies. Today, I am up on the Unity blog for the stamp of the week reminder post. These pretty lamp lights are decorated for Christmas holidays. Sentiment: Let you heart be light. This is just one of several holiday cards that I have made recently. I feel, for once, like I am ahead of schedule for Christmas. 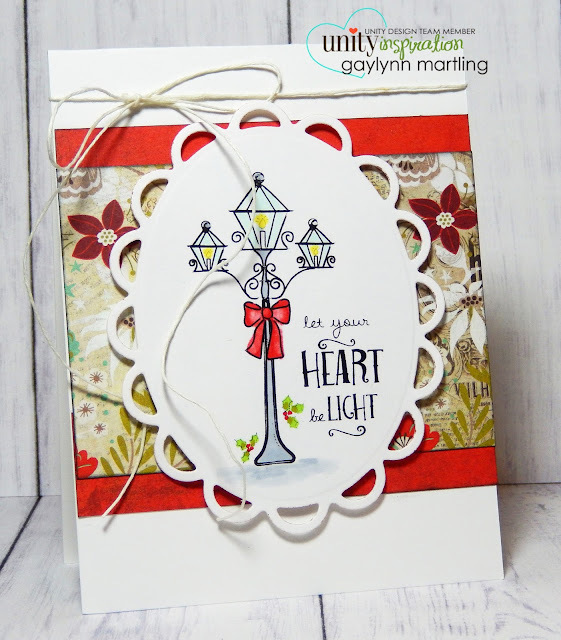 Supplies: Unity SOTW Heart be Light, Spellbinders dies, Copic markers and BasicGrey paper. Today, I am sharing a vintage post card style holiday card. 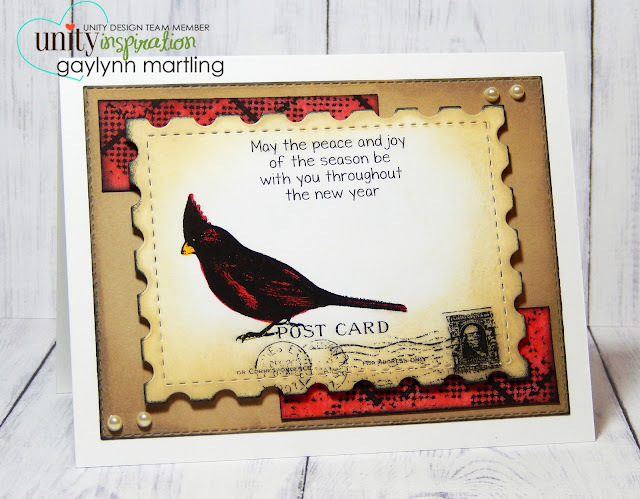 It features a cardinal bird. Sentiment: May the peace and joy of the season be with you throughout the new year. Each layer was distressed to complement the vintage post card look. The SMAK kit includes the beautiful vintage bird and the plaid background, which I made into accent strips. Supplies: Unity stamps from 10/16 SMAK Winter Beauty and 10.16 sentiment kit A Joyous Season, My Creative time dies, Ranger distress ink, Copic markers and pearls. This is a beautiful winter scene with a moose and perfect Christmas sentiments. This is winter moose bulb scene is so lovely. I wanted to keep it light and pretty. This was lightly colored and accented with turquoise papers. Supplies: Unity stamps from 10/16 KOM Holiday Hugs and 10/16 Layers of Life At Peace, Winnie & Walter dies and Copic markers. Here is a vintage holly leaves Christmas card. I really love the music notes popping up in the background and that lovely sentiment. Supplies: Unity SMAK Winter Beauty stamps, Winnie & Walter dies, Copic markers, foam tape and adhesive pearl. I hope this inspires you to get an early start on the holiday preparations. Today I am sharing two holiday greeting cards. Sentiment: Merry Christmas and a happy new year. These beautiful poinsettias are colored with watercolor. It is merry and bright. Sentiment: Holiday hugs & mistletoe kisses. 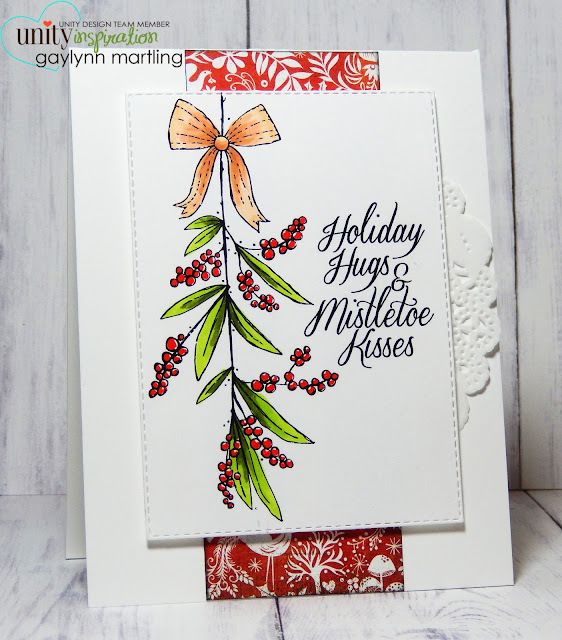 This is a festive and sweet holiday greeting card with mistletoe. I don't know about you, but if I have to start early on my handmade holiday cards if I want to get any sent out. The season is busy enough and it is nice to have some ready to send. Supplies: Unity 10/2016 KOM Holiday Hugs stamps, Copics markers, Sakura Koi watercolors and watercolor paper. 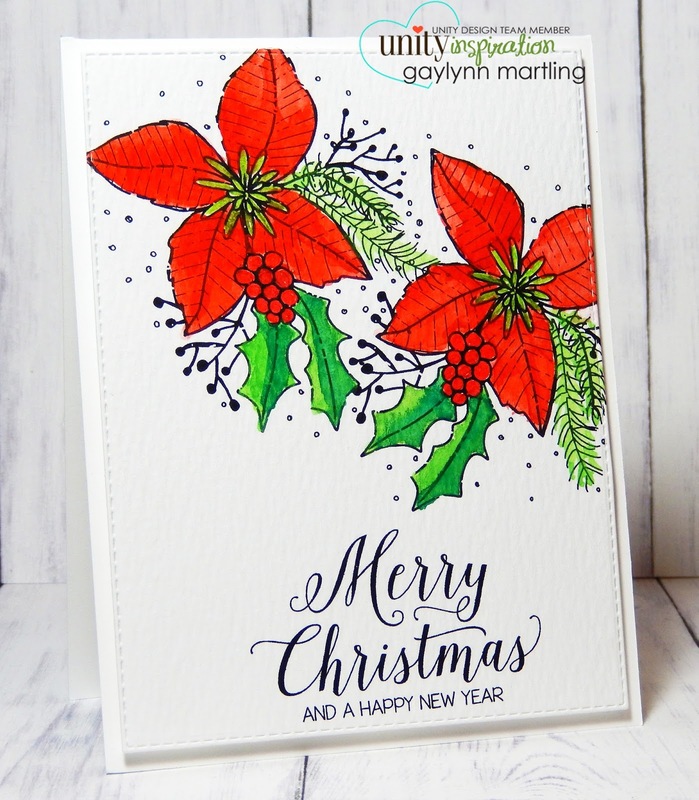 It's never too early for Christmas and Holiday cards, especially when they are handmade. I am getting a head start on the holiday cards this year. Here are two cards which sparkle in silver glitter. Sentiment: May your holidays be merry and bright. 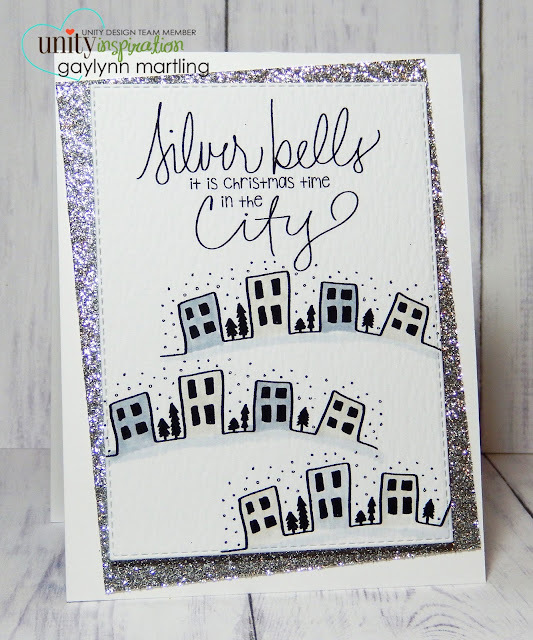 Sentiment: Silver bells. It is Christmas time in the city. I love the silver theme on these and so I kept them simple. Today I am up on the Unity blog for DT Tuesday. There is more inspiration there if you want to take a look. For my project today, I am sharing a baby girl baptism card, personalized. I adore this Unity Phyllis Harris image so much. For this occasion, especially, I wanted this to be extra soft and sweet. I added a scalloped frame and scalloped vellum topper. There is a similar little boy image available, which I will be using very soon. Supplies: Unity stamp Lil' Girl Prayin' by Phyllis Harris, Winnie and Walter dies, Lil' Inker Designs dies, Copic markers and distress ink. Here is a pumpkin spice coffee themed all occasion Autumn card. This would work for Fall birthdays, Thanksgiving and more. Sentiment: Pumpkin spice & all things nice. These leaf arrangement is breathtaking and even better is that it's on a coffee or tea mug. The background is watercolor with Brusho. The great thing about these watercolors is that the more water added, the more the color blends. I used sprinkles of yellow, orange, red and dark brown. They blended so nicely for that pumpkin spice look. Just Us Girls Challenge #363 ~ Word "Leaves"
Supplies: Unity Stamp of the Week "Pumpkin Spice", Brusho, Copic Markers, My Creative Time rectangular dies, My Favorite Things accent dies and watercolor paper.